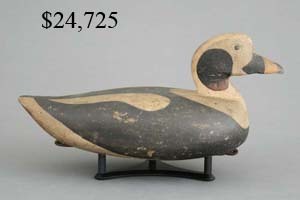 The Guyette & Schmidt, Inc. July 19 & 20, 2011 auction was our strongest summer sale in four years. The sale grossed $1.5 million with many items selling well over their high estimates. Classic pair of mallards by Charles Perdew. Rocking head blackduck by Gus Wilson. 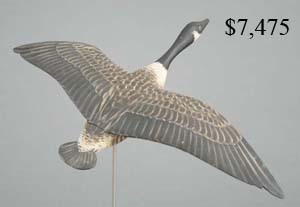 1/4 size flying Canada goose by Elmer Crowell. 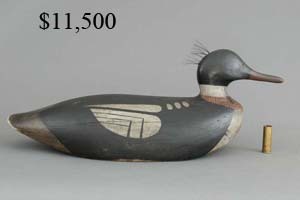 Challenge grade merganser hen by the Mason Decoy Factory. Very rare curlew by Obediah Verity. Full size preening pintail by the Ward Brothers. 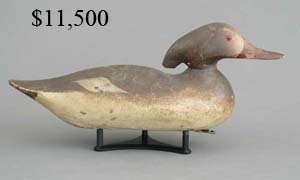 Canvasback drake by Elmer Crowell. Ruddy duck by Alvirah Wright. Very rare bluebill drake by Harry M. Shourds. Rare widgeon hen by Joseph Lincoln. Oversized merganser by Willie Ross. Rare pintail drake from the Carriage House rig. Immature goldeneye drake by George Stevens. Rare redhead hen by George Stevens. 30" long brown trout fish plaque by Malloch . 51" long Malloch school salmon fish plaque with fly. 54" long Atlantic salmon fish plaque by Hardy. 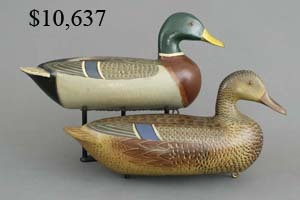 Rare rigmate pair of teal by Jafroe/Frederick/LaFrance. Oversized pair of mallards from the Delaware River. 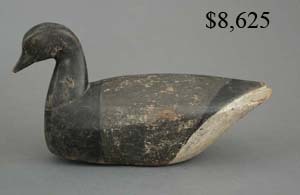 Premier grade blackduck by the Mason Decoy Factory. Important redhead drake by James Best. Rare goldeneye drake by George Stevens. 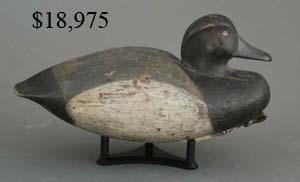 Hollow carved blackduck by Albert Cobb. 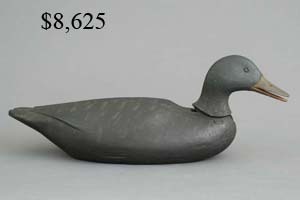 Exceptional greenwing teal drake by the Dodge Decoy Factory. Full size flying bluebill by Chauncey Wheeler. Full size flying redhead by Chauncey Wheeler. Rare willet with turned head and exceptional paint by Elmer Crowell. Rare feeding yellowlegs Walter Savary, Wareham, Massachusetts. Exceptional yellowlegs by the Dodge Decoy Factory. Very rare Mason red knot with wooden bill. 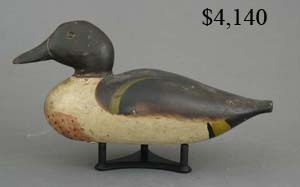 Extremely rare willet with wooden bill by the Dodge Decoy Factory. Exceptional yellowlegs with iron bill by the Dodge Decoy Factory. Rigmate pair of pintails by Horace Crandell. 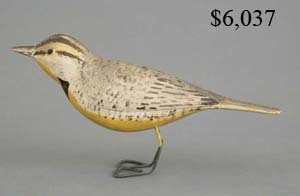 Golden plover with carved primaries by Elmer Crowell. Rare Adirondack guide boat model 28 1/2" long. Rare feeding lesser yellowlegs from Little Compton, Rhode Island. Rare yellowlegs by David Goodspeed. Hollow carved Canada goose by Cameron McIntyre. Extremely rare curlew by Walter Brady. Rare running knot from Cobb Island. Exceptional black bellied plover by Daniel Lake Leeds. 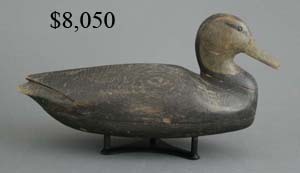 Unused Premier grade mallard drake by the Mason Decoy Factory. 32" long trout fish plaque by John Mead, North Bridgeton, Maine.